I n Elgin historian Mike Alft’s ranking of “Civic Hall of Fame” members, only two persons were deemed more prominent and influential in Elgin’s history than Dr. Joseph Tefft (1812-88). Those persons were Elgin founder James T. Gifford and entrepreneur B.W. Raymond. The number of leadership positions held by Dr. Tefft is truly impressive. Dr. Tefft was Elgin’s first doctor, practicing here for 40 years. He was the first president of the Fox River Valley Medical Association. He was the primary force in getting Elgin incorporated as a city. He was Elgin’s first mayor, serving a total of five terms. He was a town election judge and served two terms each as police magistrate and township supervisor. He was the first president of the Elgin Board of Trade, whose success helped Elgin to become the dairy capital of the Midwest, if not the entire country. He was the first president of the Elgin Dairy Club, the Elgin Agricultural Society, the Illinois Holstein Breeders Association and was the second president of the Illinois State Dairymen’s Association. He was the first president of the Elgin Dairy Co. and helped organize the Elgin Milk Condensing Co. He was a director of the Fox River Valley Railroad Co. and was the first president of the McHenry Railway Co. He was the first president of the Elgin Packing Co. and was president of the Wagonshire Insurance Co. During the Civil War, he was appointed examining surgeon of the 141st Illinois Volunteer Infantry and was surgeon of the post while the unit encamped in Elgin. Dr. Tefft was president of the Elgin Academy’s Board of Trustees for 33 years and was the driving force in finally getting the school built and opened 17 years after it was chartered. That school building, Old Main, is now in the 30th year of its second life as the home of the Elgin Area Historical Society and its Museum. He was also the first president of the Elgin Scientific and Historical Society and for several years was president of the Old Settlers Association, the two predecessors of the Elgin Area Historical Society. On social issues, Dr. Tefft was the most influential local advocate of prohibition during his lifetime, and was also an abolitionist who took in seven contrabands (former slaves), when the train load of them arrived in Elgin in 1862. Born in Lebanon, Madison County, New York, on August 29, 1812, Joseph was the first of 14 children born to Jonathan and Elizabeth (Collins) Tefft. Of Quaker ancestry, his paternal grandparents were Jeremiah and Rhoda (Hoxie) Tefft and his maternal grand-parents were Solomon and Sarah (Perry) Collins. Joseph’s siblings were: Maria (Mrs. Eliphalet Mann)(1814-59); Amos (wife: Margaret Calvert)(1815-1906); Jonathan, Jr. (wife: Delinda West)(1817-1903); Erastus (wife: Ruth Ken-yon)(1818-80); Louisa (Mrs. Persons Gilbert)(1821-1906); Eli Alonzo (wife: Tamar Eliza Hewitt)(1823-89); Thomas Wilbur (wives: Emily Betsey Joles and Frances Kinlock)(1824-1912); Minerva Sarah (Mrs. Alfred Hewitt)(1826-52); Solomon Perry (wife: Mary Van Wies)(1828-64); Emeline (Mrs. William Wardin)(1830-1909); Electa Ann (1833-35); Rhoda Jerusha (Mrs. Chancey Hawley)(1835-1922); and Susan Almeda (1837-42). Joseph graduated from the College of Medicine at Woodstock, Vermont in June 1833. On February 5, 1834, he married Emeline Gilbert in Cazenovia, New York. He left Madison County, New York, in the spring of 1835 with a company composed of himself and his wife Emeline, his father Jonathan and his family, his uncle, Dr. Nathan Collins and his family, and his brother-in-law, P.C. Gilbert and his family. Traveling by covered wagons pulled by ox teams (some sources say horse teams), the company slowly made their way nearly 800 miles, across bridgeless streams and sometimes through almost impassable swamps. Most of their household furnishings and supplies were transported by ship through the Great Lakes, which held their own dangers. Their goods finally arrived in Chicago seven months after they did, and were mostly ruined by water during a severe storm on one of the lakes. Arriving in the Elgin area in early November 1835, the families immediately made claims. Joseph took a claim on the east side of the Fox River in what is now South Elgin. Dr. Collins claimed a tract of land across the river from Joseph. Joseph’s father, Jonathan, laid claim to land about a mile east of Elgin, within the present boundaries of Cook County. Jonathan’s claim included what is now Lords Park. In 1837 Joseph traded farms with his father, taking the one in Cook County, while Jonathan settled on a 260-acre farm east of South Elgin. Settling in what is now South Elgin, Joseph and Dr. Collins hoped a town would arise there, which they named Clintonville, after DeWitt Clinton, a former Governor of New York. A dam built in 1836 washed out, but was replaced with a more substantial one. In 1837 or 1838 (there is conflicting evidence), Joseph was given property in Elgin by founder James T. Gif-ford in consideration of his making Elgin his residence. Here, at the northeast corner of Spring and Chicago streets, Joseph had the first frame home in Elgin built. 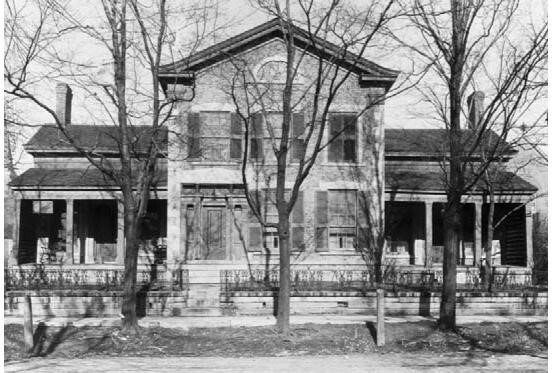 In 1836 Dr. Collins moved to St. Charles, leaving Joseph as the only doctor in Elgin Township. His practice extended from the south line of the Township north for 20 miles or more, and a similar distance east and west. The roads in those days were poor or non-existent and his trips were made on horseback in all seasons. He often had to swim streams or cross track-less prairies on dark nights with no landmarks. Joseph continued in active practice until 1875, after which he served as a consulting physician. He served as a surgeon in the Civil War and helped create the Fox River Valley Medical Association in 1864. He was president of that organization in 1864, 1868, and from 1877 until his death. In 1837 Joseph and Emeline had their first child, Mary Eliza, who died in 1842 at five years of age. Their second child, Julia Ellen, was born in 1844, the same year Emeline passed away at age 33. Julia married Robert Martin and passed away in 1894 in Topeka, Kansas, survived by her husband, five sons and one daughter. Joseph married Lavina (Johnson) Ormsbee (1815-97), a 31-year-old widow, on October 22, 1846. Lavina had one child from her first marriage, Cornelia (Mrs. Struthers). Joseph and Lavina had one child together, Leslie Eugene (1848-99). Leslie married Susan Belyea in 1872 and the couple had two children: Nellie Edna (Mrs. Sherman Spitzer) and Leslie Joseph. Leslie Eugene followed in his father’s footsteps and earned his medical degree in 1887. In 1846 Joseph bought a vacant lot at 218 E. Highland Ave., just west of the Methodist Church. Here he had a big cobblestone and brick home built, completed in 1849. This home remained in the Tefft family until 1914, when it was sold to the First Methodist Church next door, which used it as a Sunday School, nursery and meeting place for several years. In 1923 the home was razed to make room for a big new church. Joseph was an eminently practical man, whose beliefs and convictions were shaped by science and experience. As a doctor he was well aware of the harmful effects of alcohol, calling it a “liquid poison.” In an era when the alcohol debate was a leading social issue, Joseph was the most outspoken, articulate and influential local temperance advocate. However, without city status, Elgin had no way of restricting or regulating the sale of alcoholic beverages. Thus, Joseph was the driving force in obtaining a city charter (incorporating) in 1854. The city charter was procured to, among other things, prohibit the sale of intoxicants, which was the main issue in the vote on adoption of the charter, and in the first city election, at which Joseph was chosen mayor. In his first term as mayor, the City Council passed a prohibition law against the sale of intoxicating liquors. During Joseph’s first two terms as mayor, in 1854 and 1855 (mayoral terms were for one year until 1881), the law was strictly enforced. However, the liquor interests brought about the election of officials sympathetic to their cause, and in 1856, after Joseph left office, saloons started to reappear. Though still outlawed by the prohibitory ordinance, the law wasn’t enforced. In 1858 a liquor license ordinance was passed, expressly allowing saloons, though now governed by regulations and fees. Joseph served five terms as mayor: 1854, 1855, 1863, 1866 and 1868. In his 1866 inaugural address he was as personally opposed to liquor as ever (“…of no use or benefit to mankind”) but was resigned to accept the licensing system as the will of the people. However, he did advocate higher licensing fees, fixed closing times, and enforcement of the ordinance against gaming in liquor establishments. Joseph often regretted that Elgin could not remain a temperance city, but was always proud that it was so during his first two terms. Elgin’s dairy industry began in the 1850s and, thanks to the Elgin Board of Trade, became nationally influential by the 1880s. No single person was more responsible for the success of the local dairy industry than Joseph. The first can of milk that was shipped by rail from Elgin to Chicago, in February 1852, came from Joseph’s farm in what is now the Lords Park area, then tenanted by Phineas Smith. The success of the milk trade in Chicago led many Elgin-area farmers to switch to dairy farming. By the mid-1860s there was often more supply than demand for fluid milk. This gave rise to numerous small cheese and butter factories called creameries. In 1870 Joseph helped organize, and was the first president of, a co-operative butter factory called the Elgin Dairy Co. at Harvey and Ball streets. This was the first steam-operated butter factory west of the Great Lakes and its product was far superior to hand-churned butter. The creameries sold the cheese and butter to middlemen who were often unscrupulous in their dealings. The dissatisfaction of the creamery operators led Joseph to suggest and help organize a commodity exchange for cheese and butter in 1872, called the Elgin Board of Trade. The Elgin Board of Trade, of which Joseph was president for the first nine years of its existence, was so successful that, by the mid-1880s, it set prices on cheese and butter for much of the country. Producers now had a fair and stable market and, thanks to rigid grading standards, Elgin cheese and butter guaranteed top quality and thus commanded high prices. In order to increase milk production, farmers began to import stock and follow scientific methods of cattle breeding. In 1874 the first black and white Holsteins from the Netherlands appeared in the area. Joseph bought a Holstein cow in 1875 that produced an impressive daily yield of eight gallons. In 1885 Joseph became the first president of the Illinois Holstein Breeders Association and within a few years the daily yield of some cows was astounding. In 1888, within a year of his death, Joseph helped to organize the Elgin Condensing Co., a competitor of Gail Borden’s Illinois Condensing Co. Opened in December 1856, the Academy’s development was retarded by chronic deficits. During the Civil War the buildings and grounds were advertised for sale to pay off the mortgage. 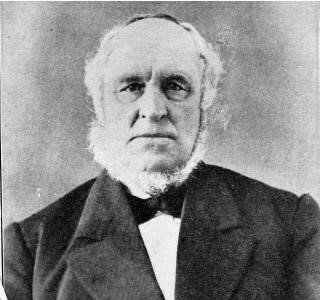 On the day of the sale, after the auctioneer had made his announcement of the terms, Joseph stepped forward and declared, “It is a blame shame and disgrace to the citizens of Elgin to permit this sale, and I will be one to redeem it.” His words inspired contributions from others, and the sale was called off. When people complained to him that Academy stock paid no dividends, Joseph would declare that no stock ever paid better dividends. He held tenaciously to the belief that his farm was worth more, valuations generally were higher, and the city and surrounding country were much better materially when the people were educated. In 1888 the Academy Board exhibited appreciation of his long and faithful service by declining to accept his resignation when he was unable to attend its meetings due to declining health. Joseph passed away on August 26, 1888, of chronic nephritis, three days short of his 76th birthday. Several members of the Tefft family were important in the early history of South Elgin. Joseph initially settled there in 1835 and by 1838 had helped build two dams (the first one washed away) and a saw mill. In 1847 Joseph and B.W. Raymond platted the west side of “Clinton” in anticipation of the railroad. Joseph’s sister Maria was the teacher in the first schoolhouse in Elgin Township. Built in 1837 at the northwest corner of Route 25 and Kenyon Road, this log schoolhouse was replaced with a frame structure and then, in 1925, with a brick structure. The school closed in 1946 but the building still stands. The Kenyon family bought the property in the early 1880s. In 1844, Maria’s husband, Eliphalet Mann, opened a stone quarry on the west side of the river. After several expansions and changes of ownership, South Elgin’s stone industry was booming by the 1890s. Joseph’s brother Jonathan, Jr. eventually took over his father’s farm along the east side of Route 25, just south of Kenyon Road, extending into Cook County. He once raised sheep (600 head at one time) and later switched to dairy farming. Jonathan’s son Frank (1862-1921) became a veterinarian. The Tefft farm was sold in the mid-1930s to the Chicago Gravel Co. In 1852 in South Elgin, Joseph’s brother Erastus built a paper mill to manufacture wrapping, and later, roofing paper. Between 1873 and 1885 brother Eli was a partner in numerous South Elgin enterprises, including a creamery; ice house; stone quarry; fork factory; iron foundry; and grocery. The Tefft name lives on today in Tefft Ave., a short street on former Tefft property just southeast of Lords Park, and in Tefft Middle School, the first junior high school in Hanover Township. Opened in 1964, the U-46 School Board recognized that the Tefft family represented a historical link between Elgin and Hanover townships, just as School District U-46 links the two townships today. Acknowledgements: Mike Alft’s books and newpaper articles; “South Elgin: 150 Years of Heritage, 1835-1985,” by Ralph Tredup (1989); obituaries; newspaper articles; “A History of Elgin Academy of Northwestern University,” by L.K. Becker (1906); etc.